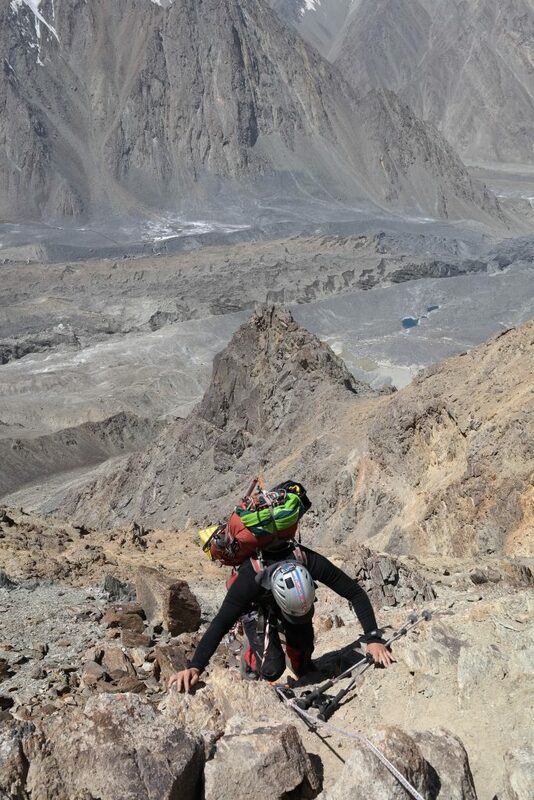 In 2014 and 2015 I spend summer months attempting the legendary “Snow Leopard-peaks challenge” in the heart of Central-Asia. Five mountains reach the altitude of 7000 meters in the area of former Soviet union: Pik Korzhenevskaya (7105m) and Pik Kommunizma (7495m) in Tajikistan and Pik Lenin (7134m), Khan Tengri (7010m) and Pik Pobeda (7439m) in Kyrgyzstan. 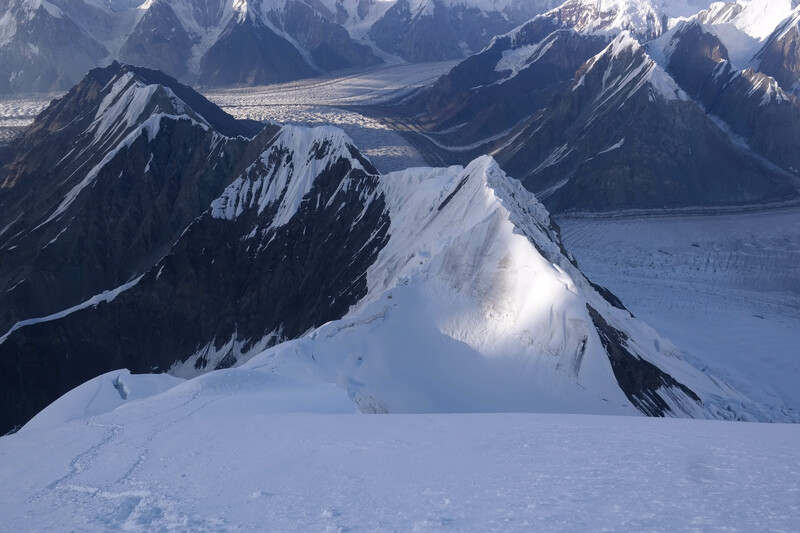 The person who climbs all five, gets a tittle of “Snow leopard”. 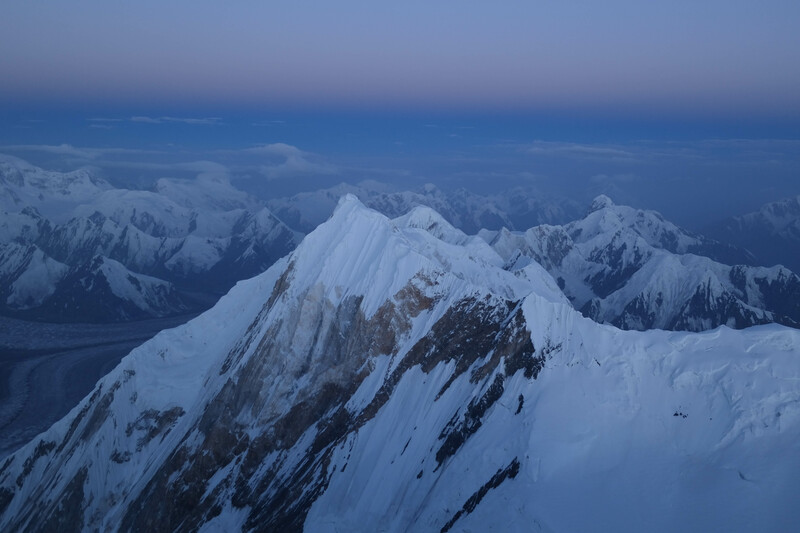 The main idea was to get familiar with high alttitude and climb these amazing mountains as a preparation for the future. In 2014 I partnered with Lauri Hilander as we attempted Tajik giants. The following year my plan was to solo and break Denis Urubko`s record of climbing all five less than 42 days. This is a long post full of pictures. You can find more detailed trip reports from Relaa.com (in Finnish). 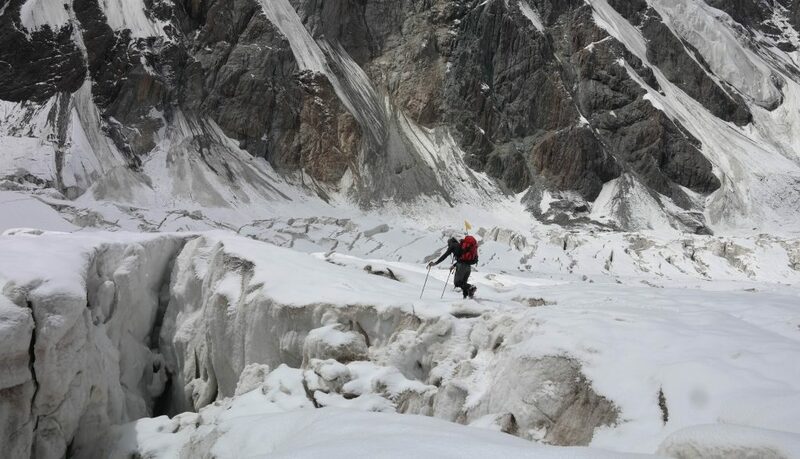 After a long night flight to Dushanbe, we immediately headed to Gisarssky mountains. 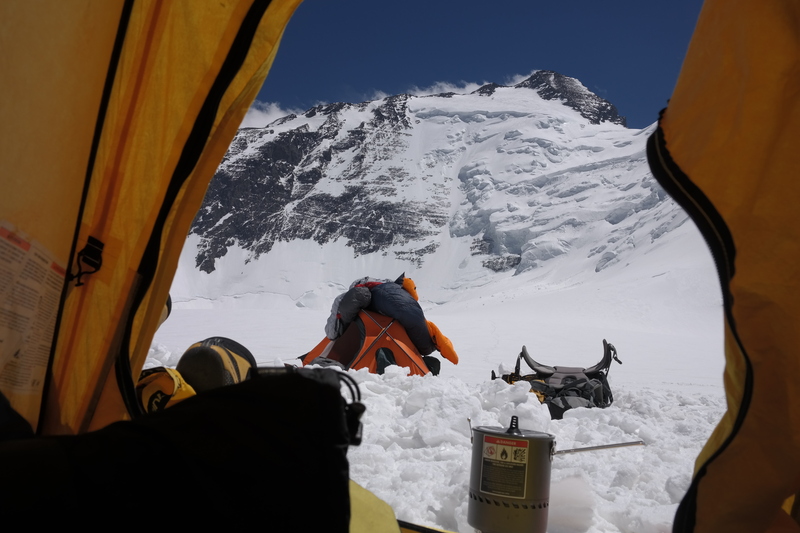 We summited Kulai Javonov (4000m) and spent two nights at 3200 meters. We didn´t want to take a risk of flying straight up to Moskvina BC (4400m). Very wise indeed! 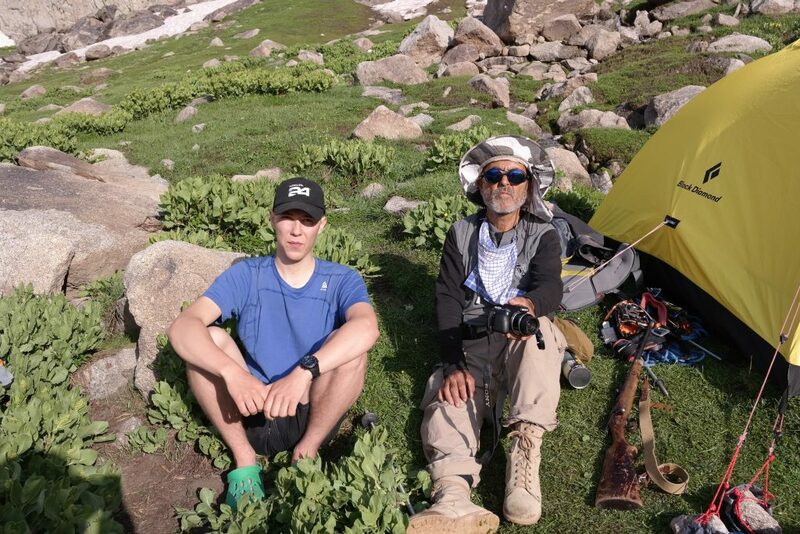 Encounter with Shakram, the Tajik hunter, was pretty nervous as we all remembered Nanga Parbat 2013. 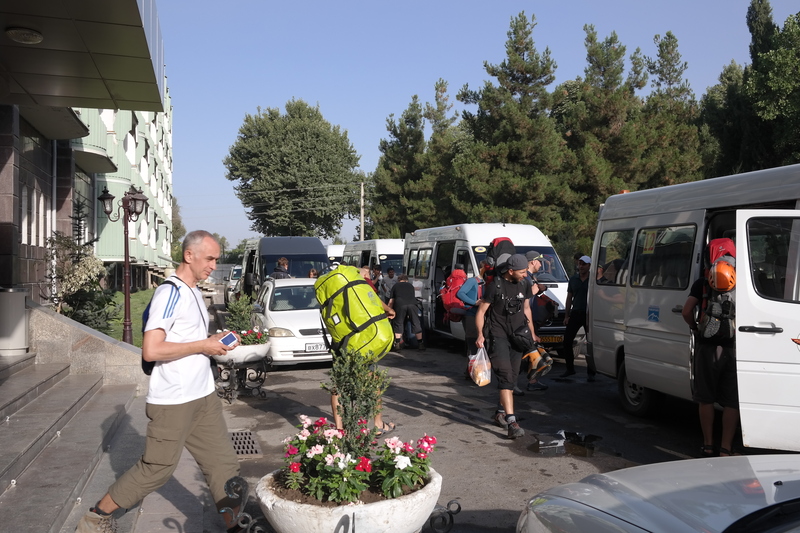 After a short recovery in the weird Dushanbe, we continued to the Djirgital via Pamir highway. 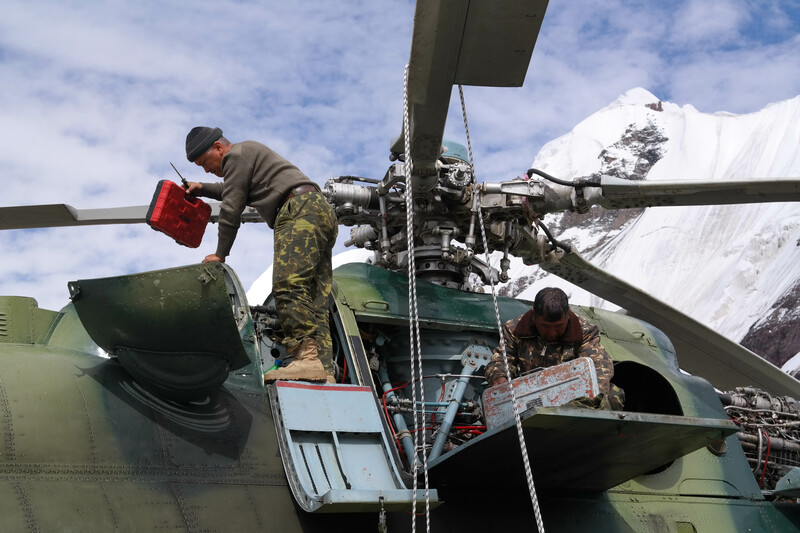 MI-8 dropped us to the Moskvina glade BC. Pik Kommunizma. The peak is actually giantic! First days around BC went walking around and getting used to new elevation. Mother nature showed whose the boss. 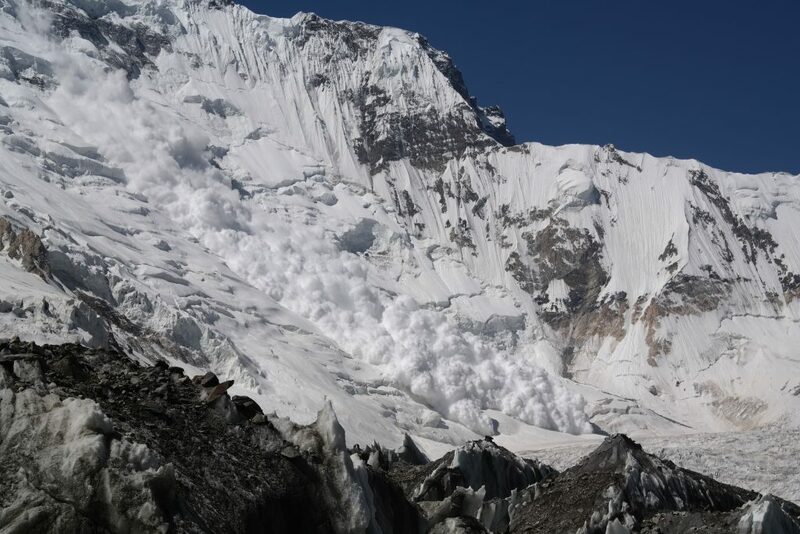 Big avalanche running down. 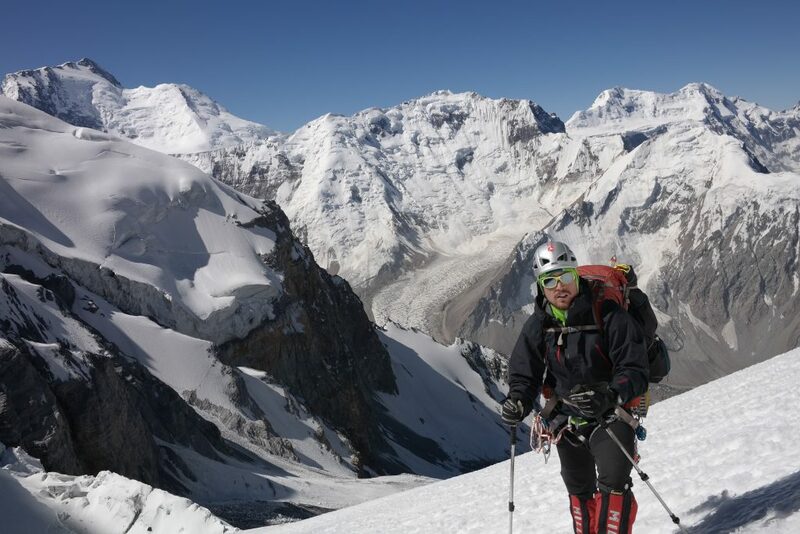 We did one acclimatization rotation on Korzhenevskaya, before the summit attempt. Scree slopes below the Camp 1 were torturing. 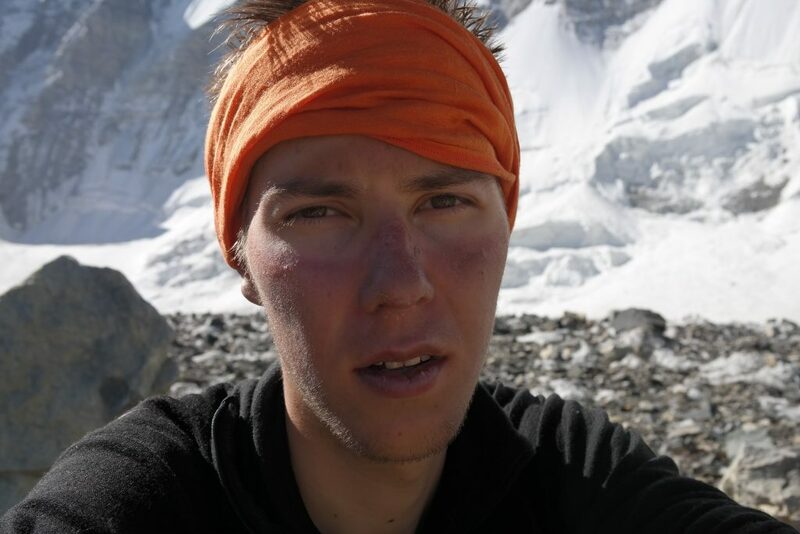 Lauri at 5500 meters on Korzhenevskaya. Giant Kommunizma in the background. 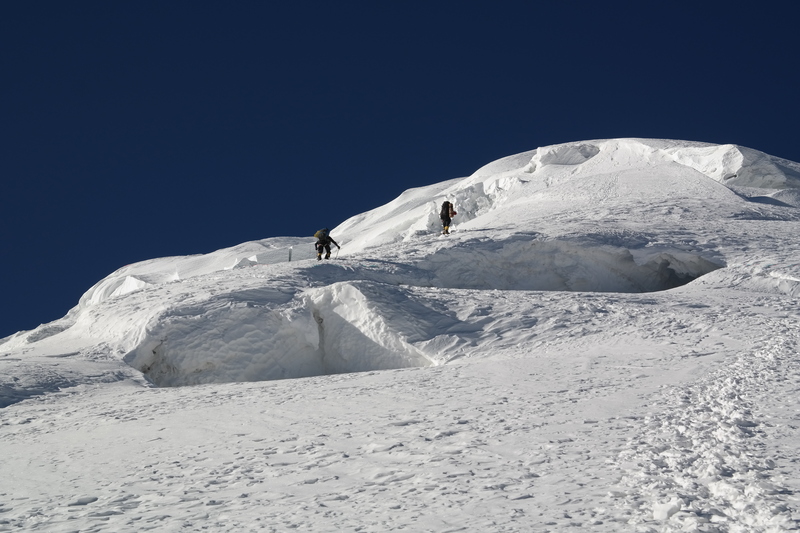 Weather was stellar the whole time and we were able to start our summit attempt in time. 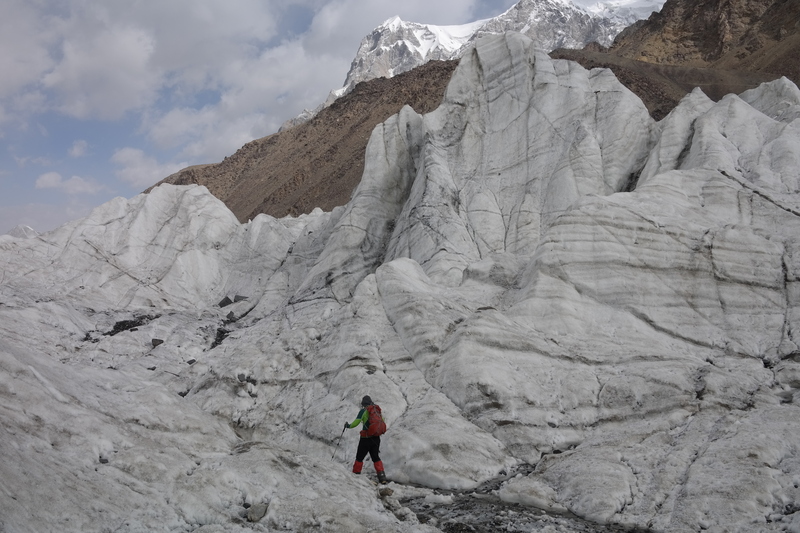 Lauri finding his way through the Moskvina glacier. 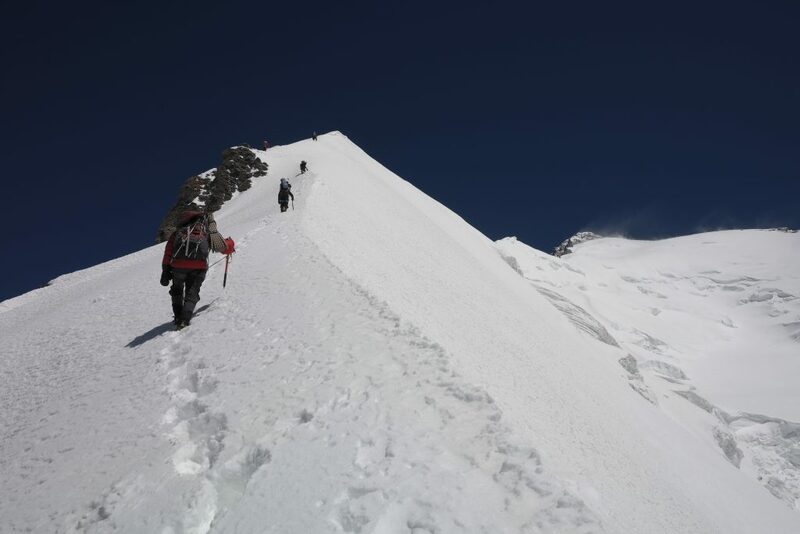 On day one we climbed up to C1 (5300m) and the following day up to C3 (6400m). Czech climbers just below the C3. 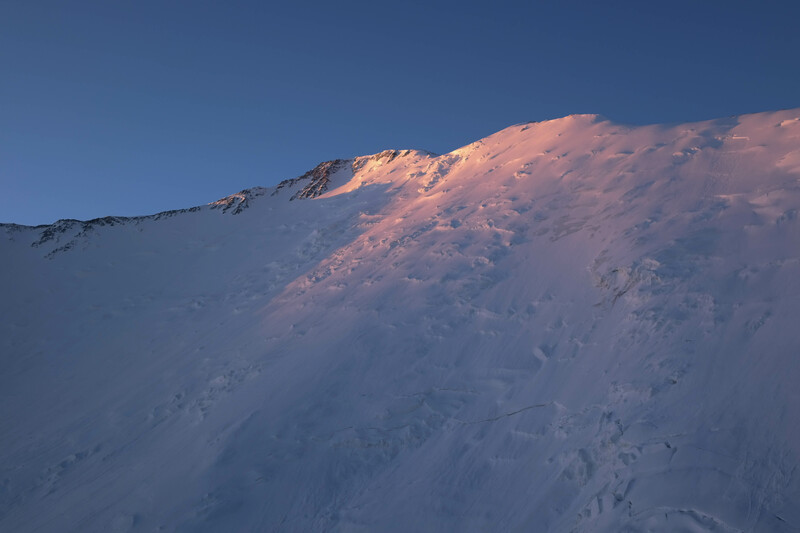 Korzhenevskaya`s summit is already visible. Summit day was cold and clear. 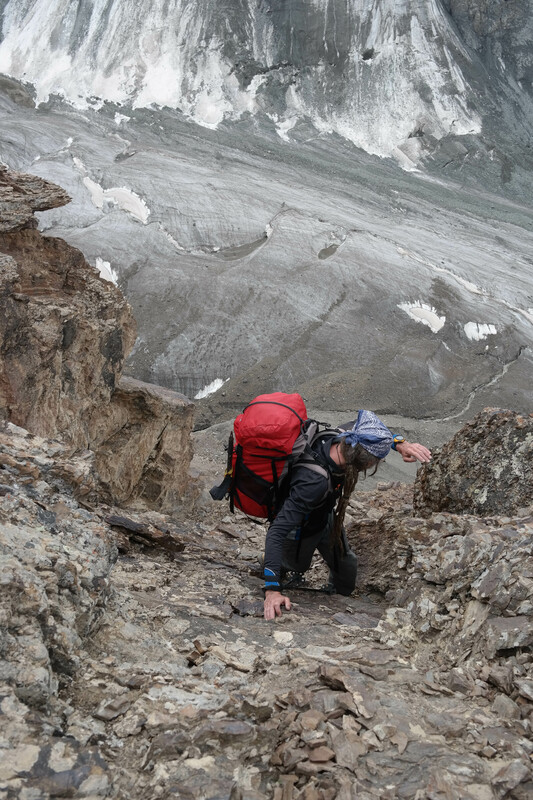 Lauri on the upper ridge. 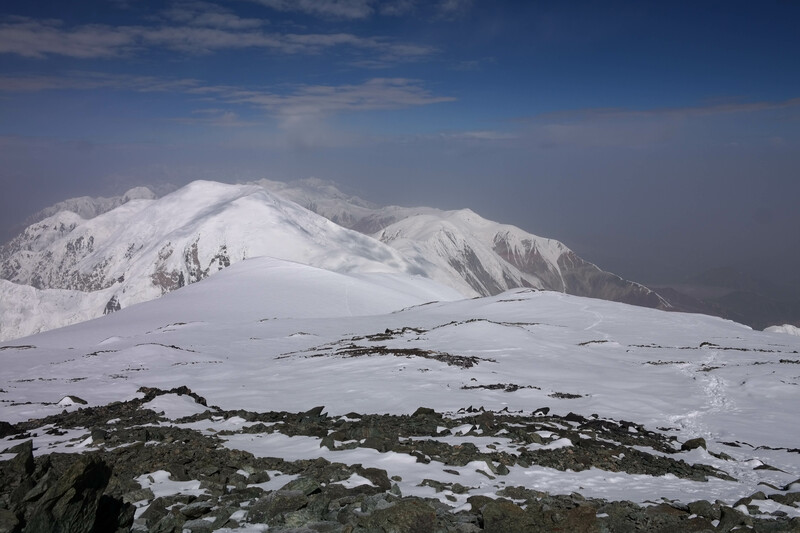 We summited Korzheneskaya (7105m) at 9:40 am and returned back to BC on a same day. Lauri got a minor frost nip to his toes, so I deciced to attempt Kommunizma on my own. 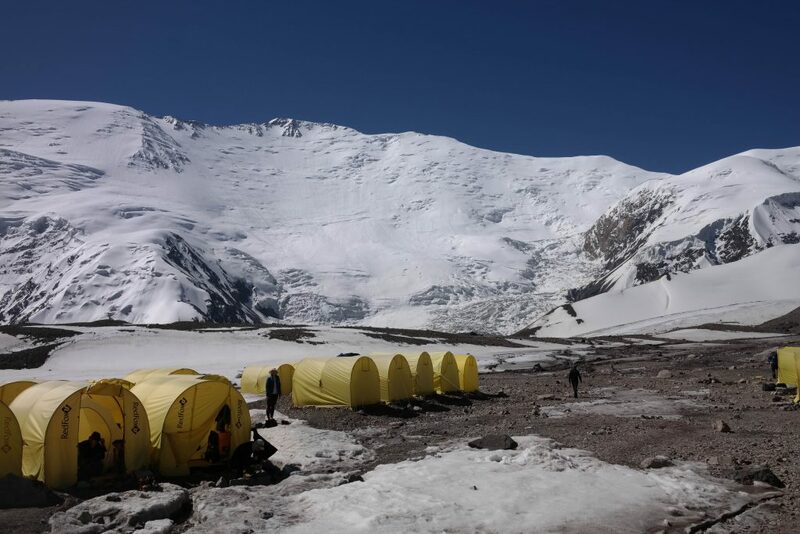 Camp 1 (5300m) on Kommunizma. The route to this camp is extremely dangerous due to hanging seracs. I´ve never been so scared. 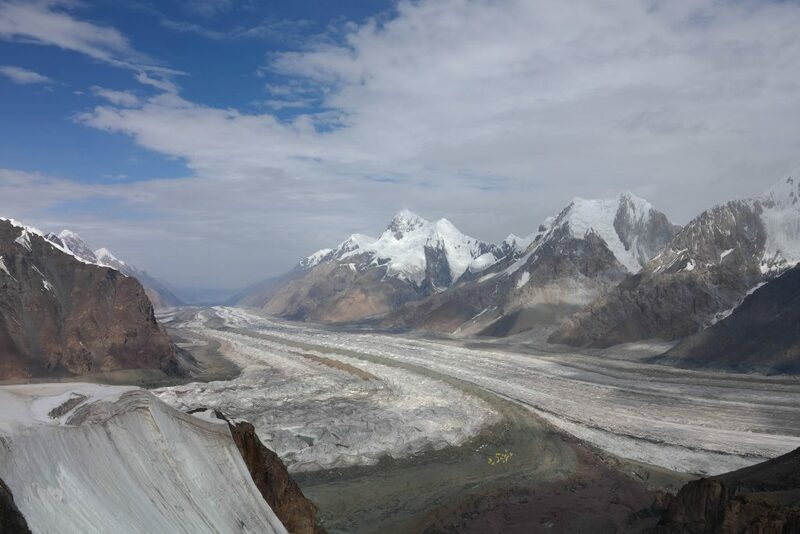 BC is located between the two glaciers middle of the pic. 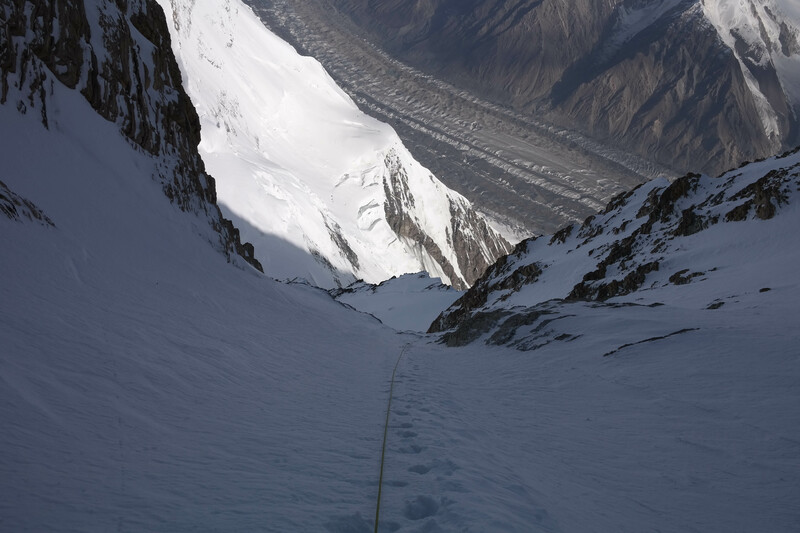 On a second day the route follows the Borodkin Spur. 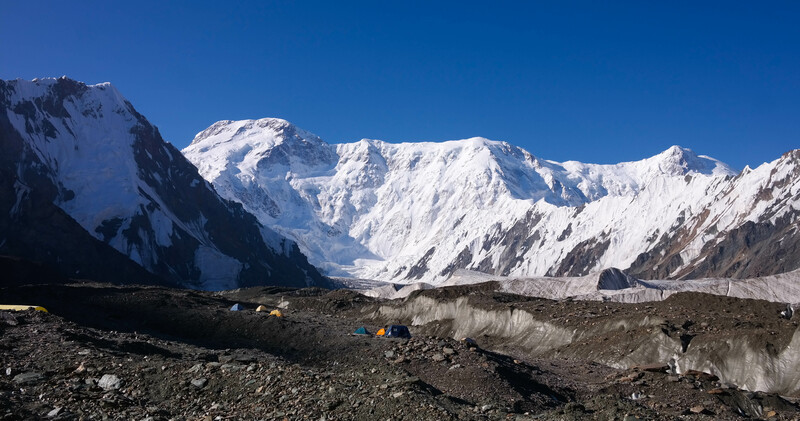 Camp 2 (5800m) on a Big Pamir platteu. Here my bronchitis got worse and I deciced to abandon the attempt. Very happy to be able to act alone on a big mountain while feeling sick. 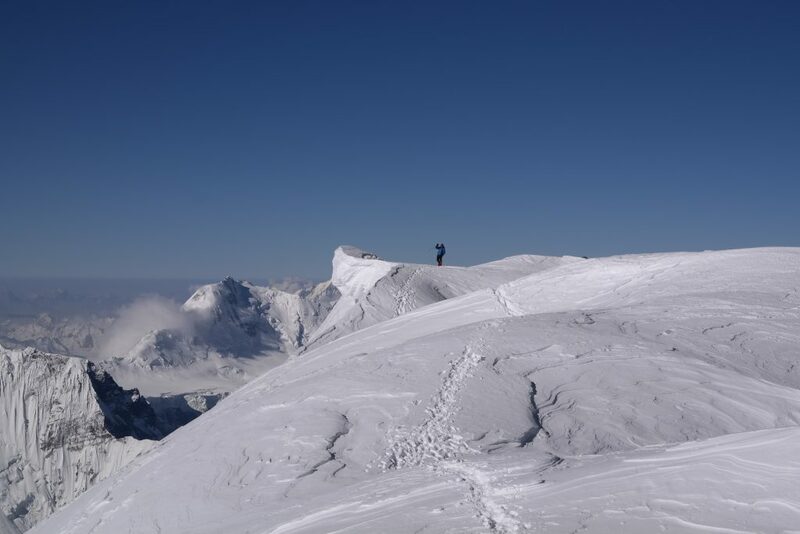 We managed to summit our first 7000 meter peak which was pretty awsome. Though, everything felt a bit too easy in the end. Kommunizma is still waiting our second visit! Tajikistan is a weird country and I recommend to acclimatize elsewhere and do a very quick trip to Moskvina BC. And cook your own BC food! 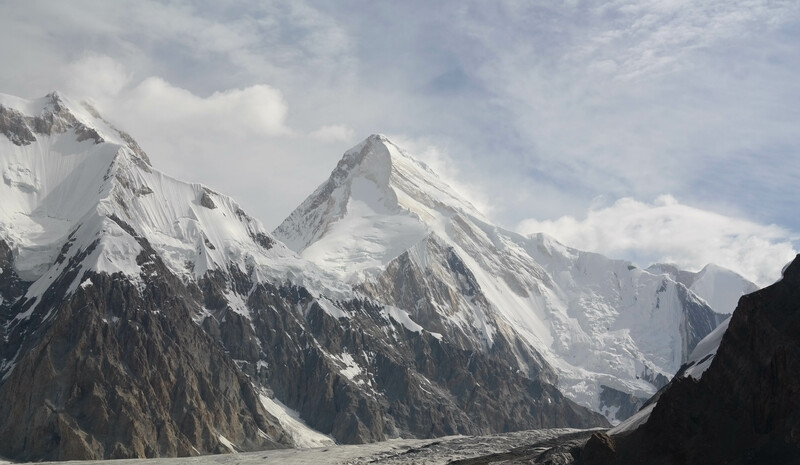 Pamir Peaks is the only operator, but book via Ak Sai-Travels. Their service is better! 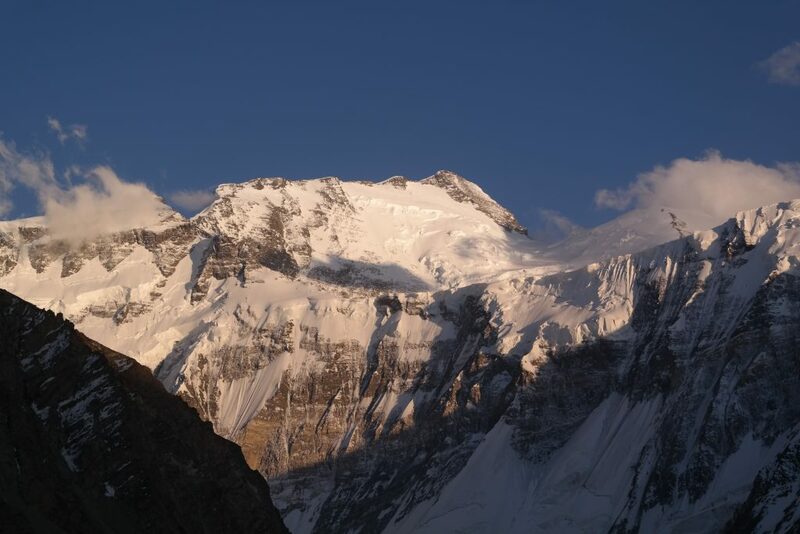 There´s some other interesting peaks in the region too, like Pik Moskva. Like I told, the plan was to attempt to climb all five peaks in a summer, but only one day before the departure, Tajik operator cancelled scheduled MI-8 flights. 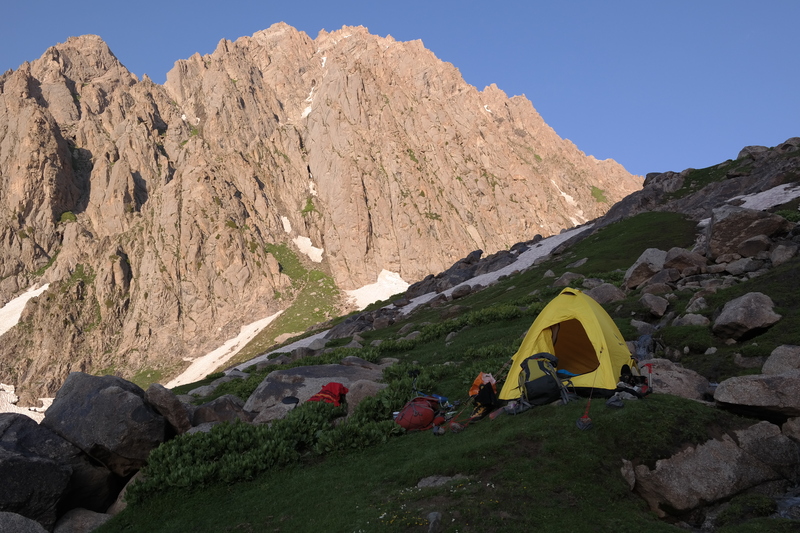 I had no other choice than travel to Kyrgyzstan and try to climb three remaining peaks inside it´s borders. It became an very exciting expedition after all! 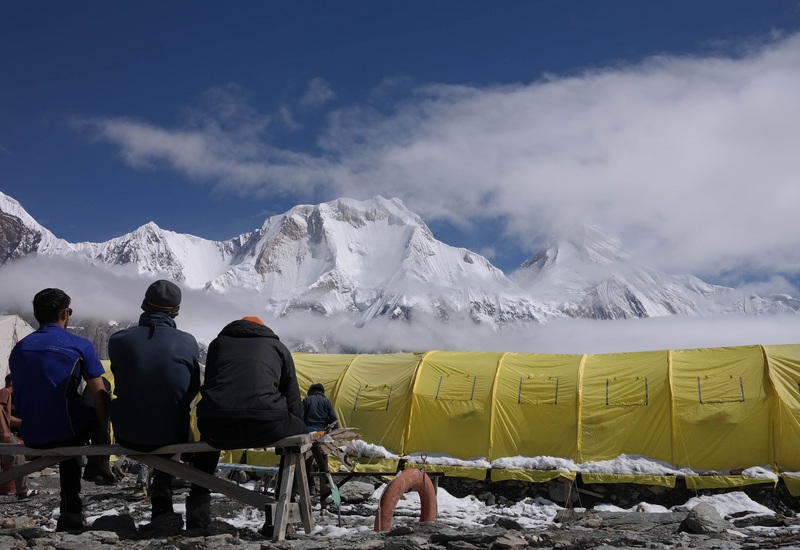 Travelling from Finland to the Base Camp of Pik Lenin took couple days. I spent first few days wondering around BC (3600m). 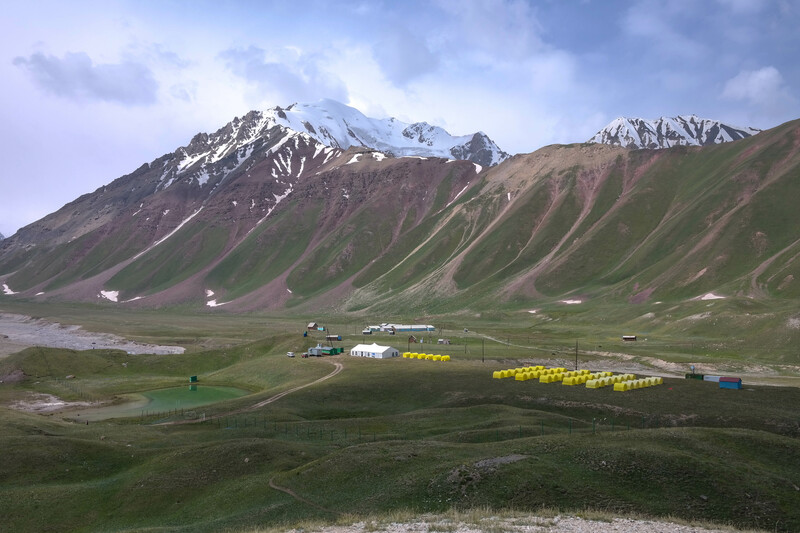 Green and lush meadows reminded Elbrus north side BC. Hike up to C1 or ABC (4400m) was an painful experience with a 40kg load. ABC offers same kind of a services than BC. Pik Lenin`s avalanche prone N face ahead. Again. I did only one rotation to get acclimatized – two nights at C2 (5300m) and one night at 5800m. My lonely 5800 meters camp. Wasn´t feeling too good on a rotation, but it´s always like that. Hard work pays in the end. 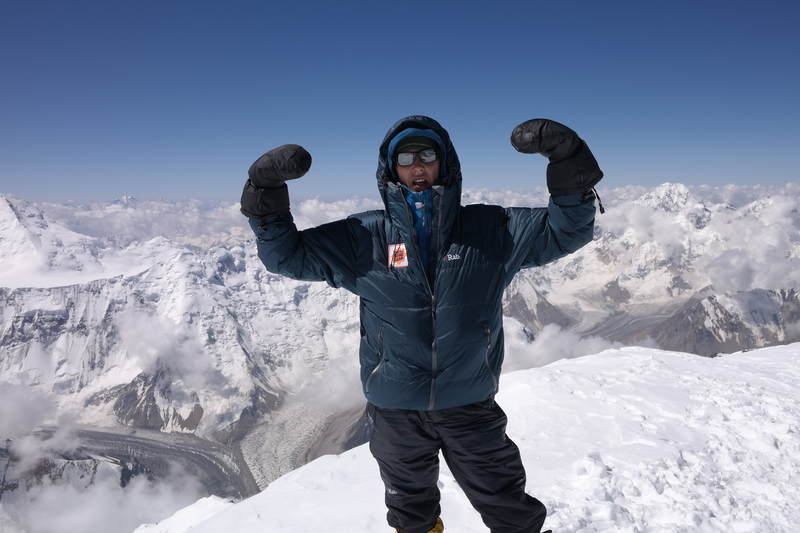 After one rest day at ABC I climbed directly to C3 (6100m). 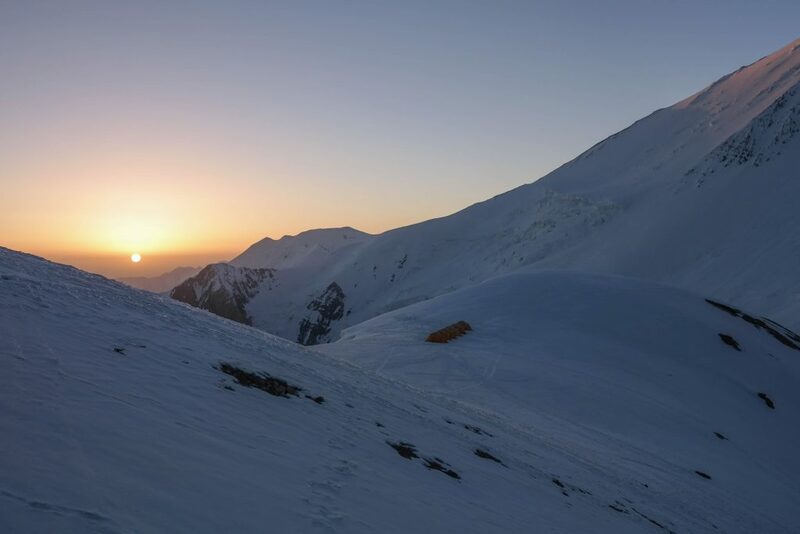 Sunrise over the Kyrgyz plains was beautiful. C3 at 6100 meters. 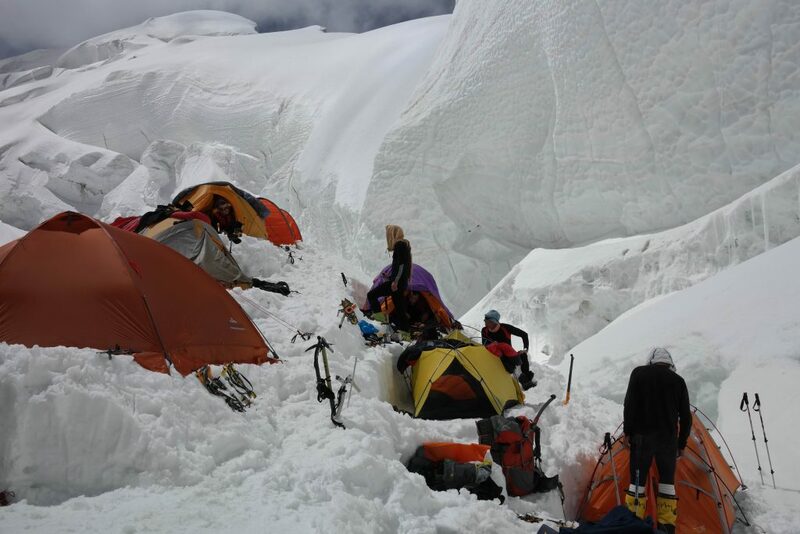 Lot of people in the camp, but very few continued to the summit. Endless trail breaking paid off. 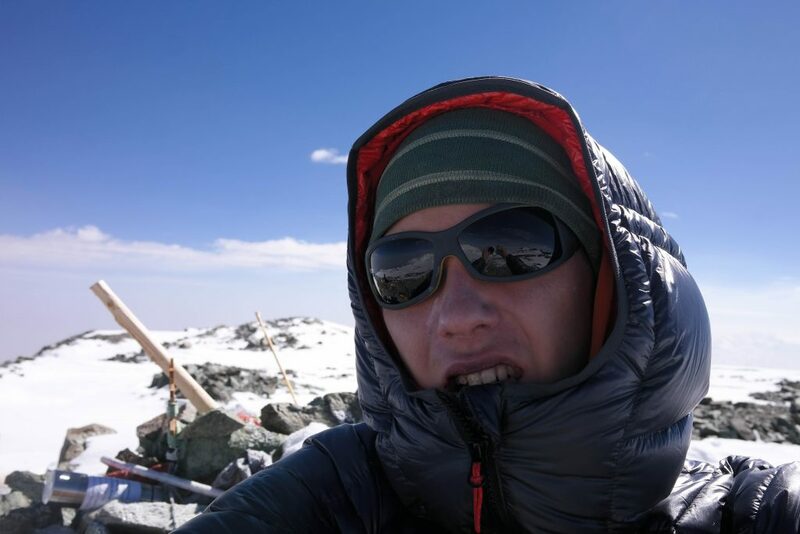 On the summit of Pik Lenin (7134m). 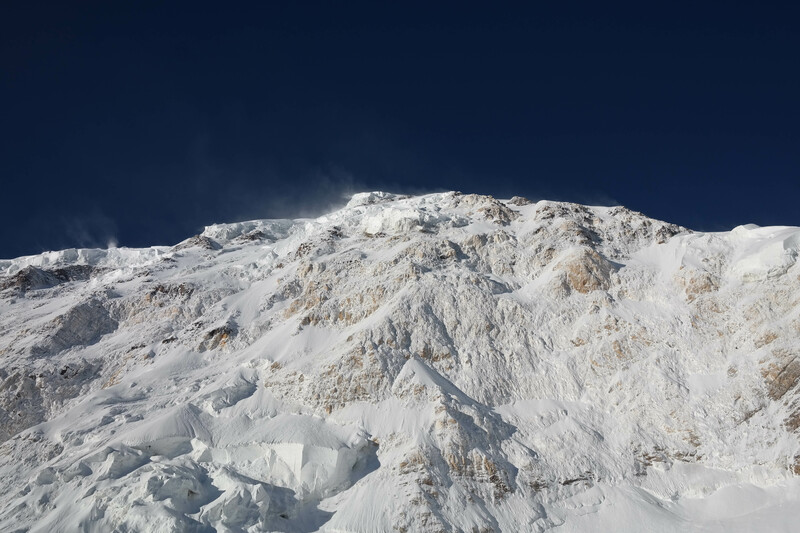 Three other climbers summited that day. I returned all the way to the ABC the following night. 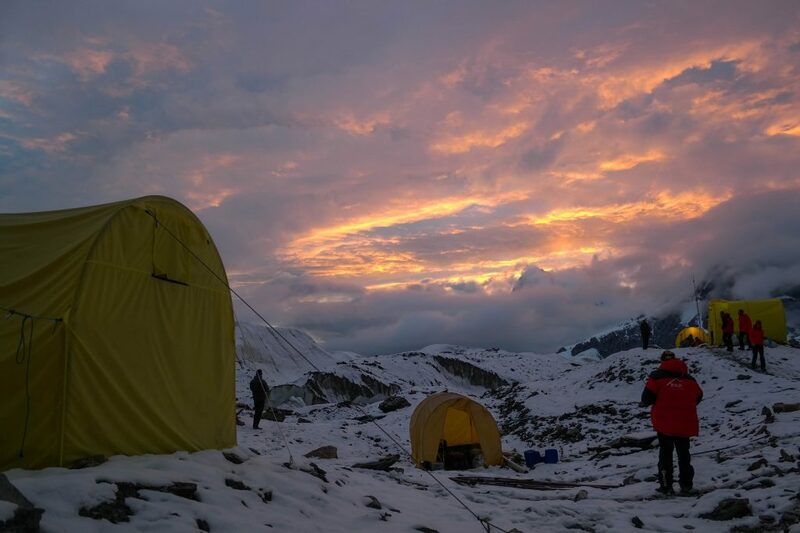 Slept few hour at C2 waiting glacier to freeze. 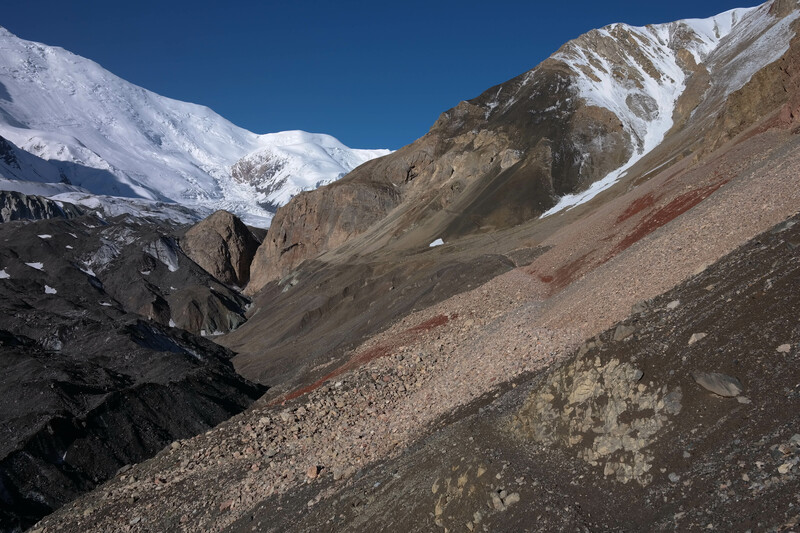 Succes on Pik Lenin lead to quick change of a mountain range. 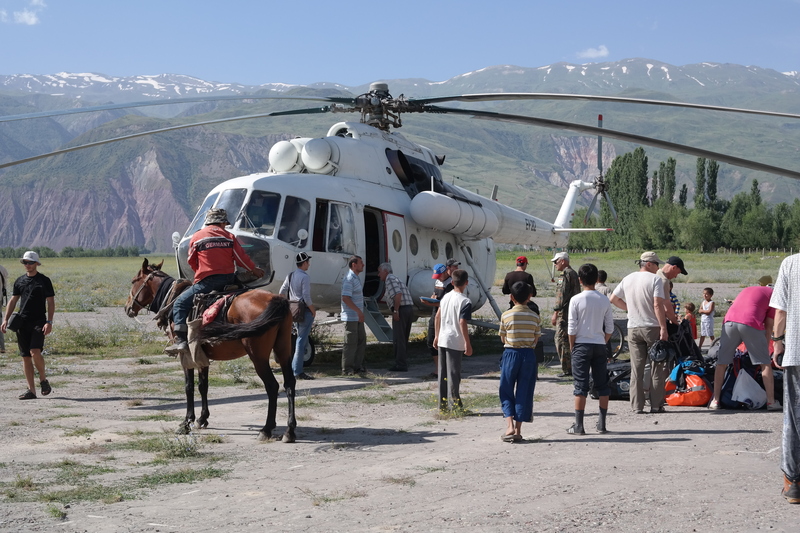 I flew to Bishkek and continued deep into Tien Shan. 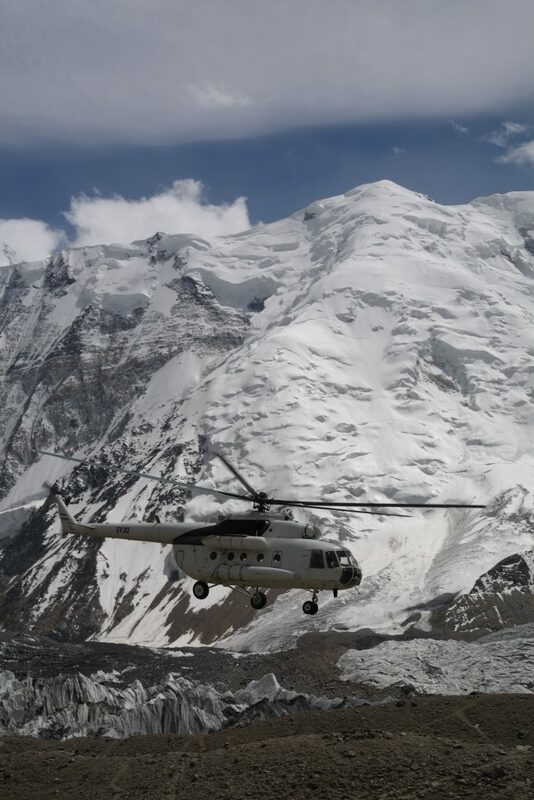 MI-8 dropped me to the Southern Inylchek BC (4100m) on the 20th of July. 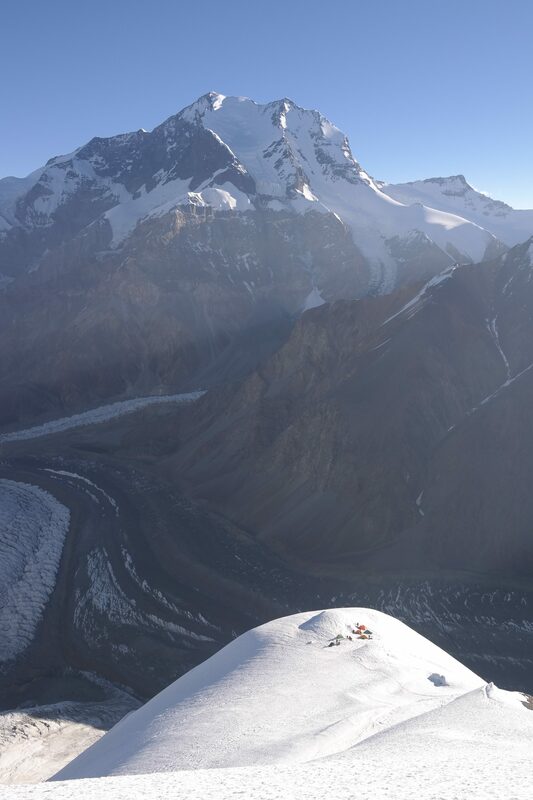 I would attempt Khan Tengri (Southern route) and Pik Pobeda (Normal route) from there. Spectacular views from BC. 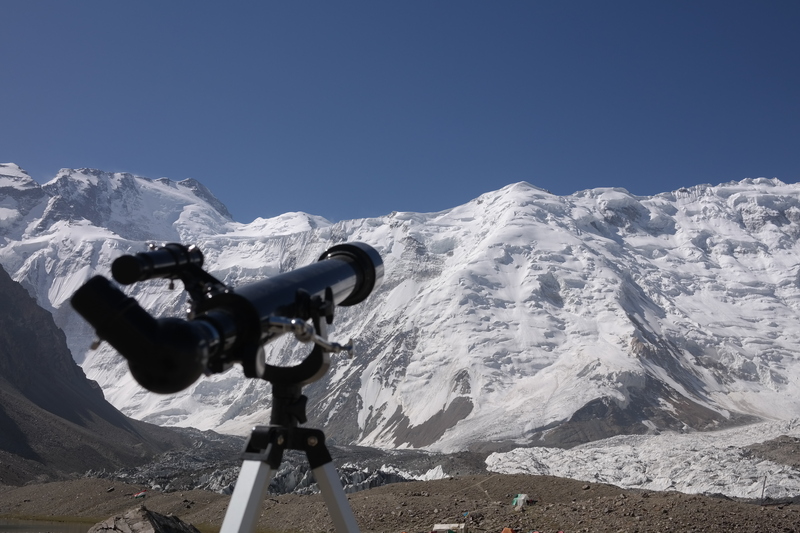 Khan Tengri in the distance. 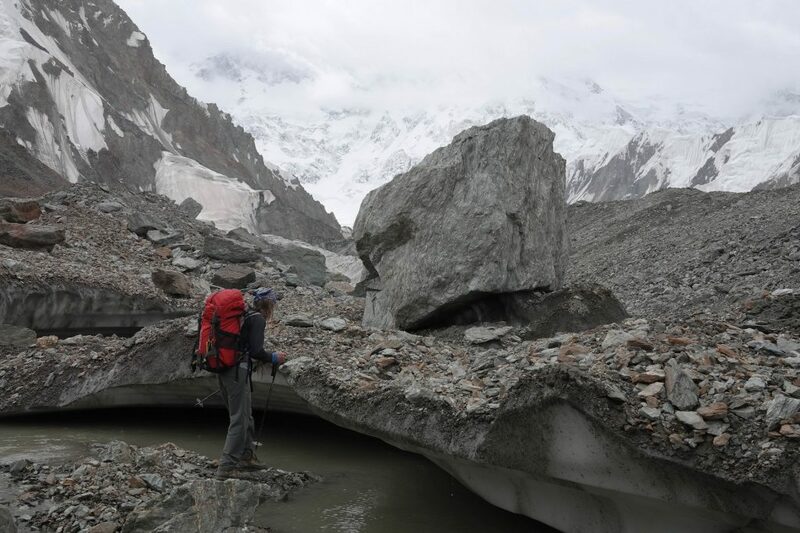 Evening walk to Khan Tengri`s Camp 1 (4300m) on flooding glacier was a pleasant way to start ascent. 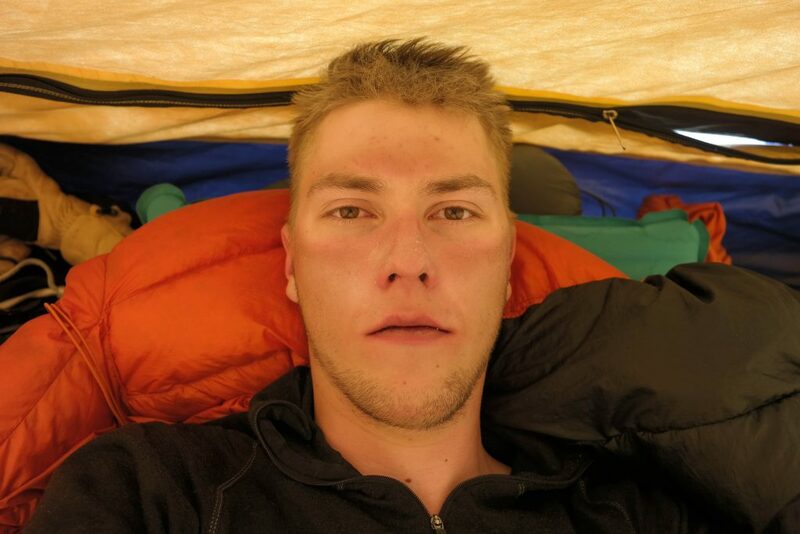 I ran up to West Col in 6 six hours through the Valley of Death on 21st of July. 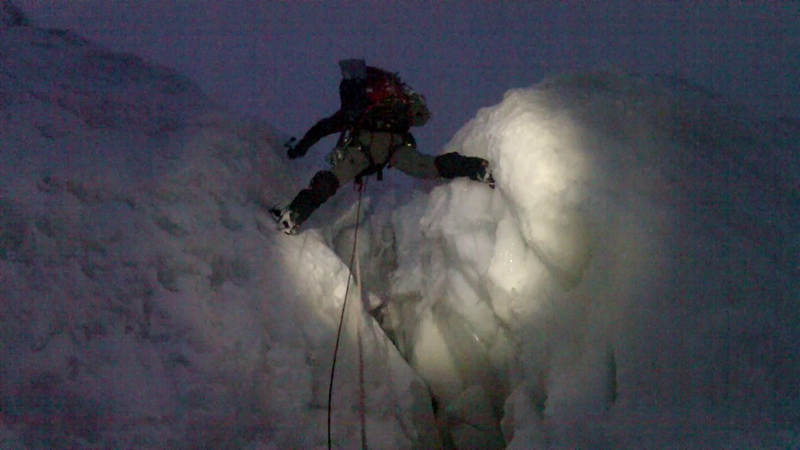 Maze of crevasses, seracs and avalanche debris kept my pace up in the dark. 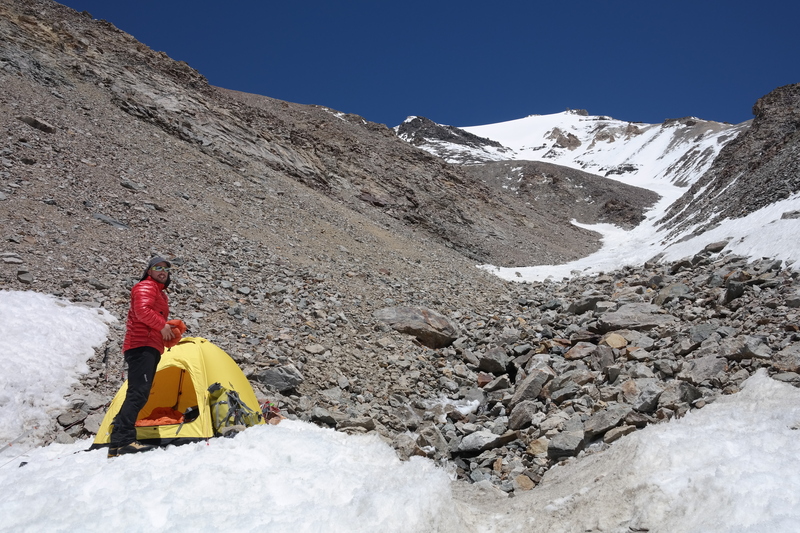 Camp 3 (5800m) under the West col´s schrund is a sheltered place to camp. 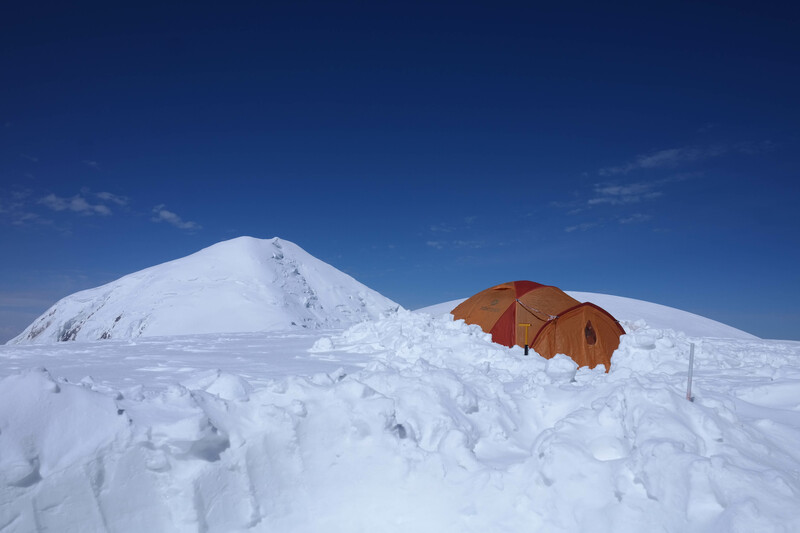 I was the only one who started towards the summit that night. Lack of fixed ropes probably scared everyone away. 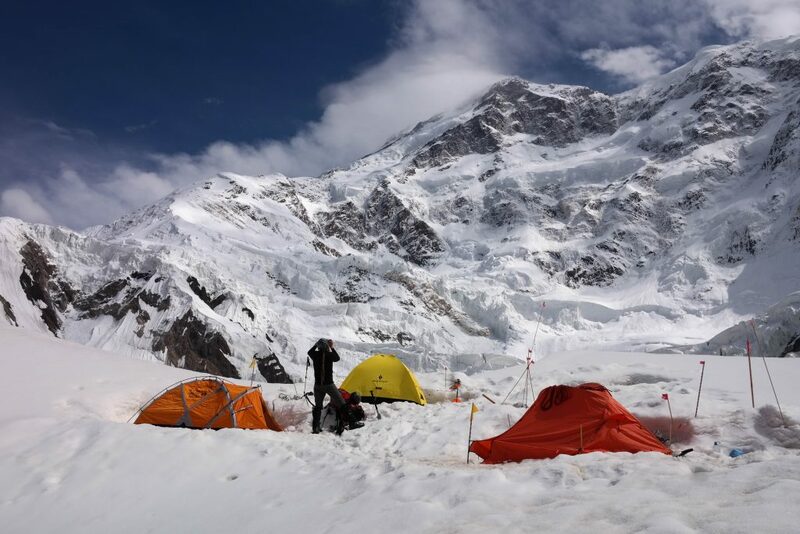 The route was fixed just up to 6400 meters. 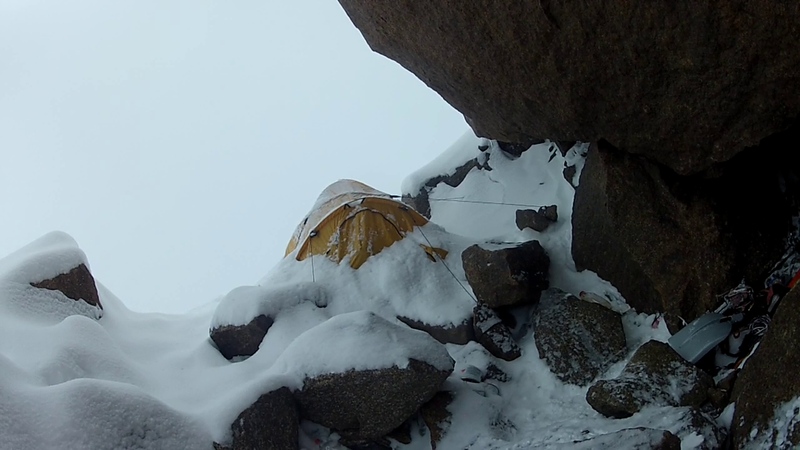 West ridge was quick to climb, but getting into couloir was nasty. My pace was really slow due to fact that I had to dig old fixed lines up. Snow was unstable and that was my only option. I reached the summit of Khan Tengri 10:20 am on 22nd of July as a first person of the season. What a wonderful day! I definately loved every second being alone! 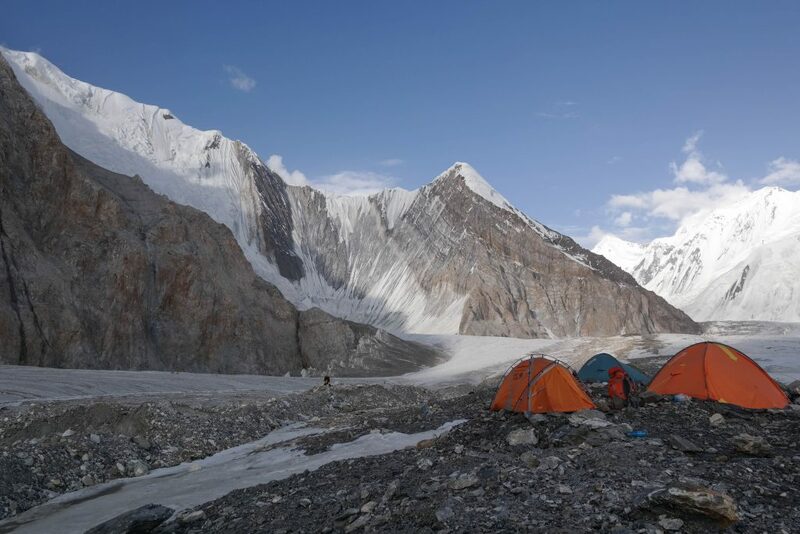 I reached BC`s safety on 23rd of July. Warm and sunny weather turned stormy and windy quickly after my return to BC. Next two weeks everyone waited a weather window to attempt Pik Pobeda, one of the coldest mountains in the World. 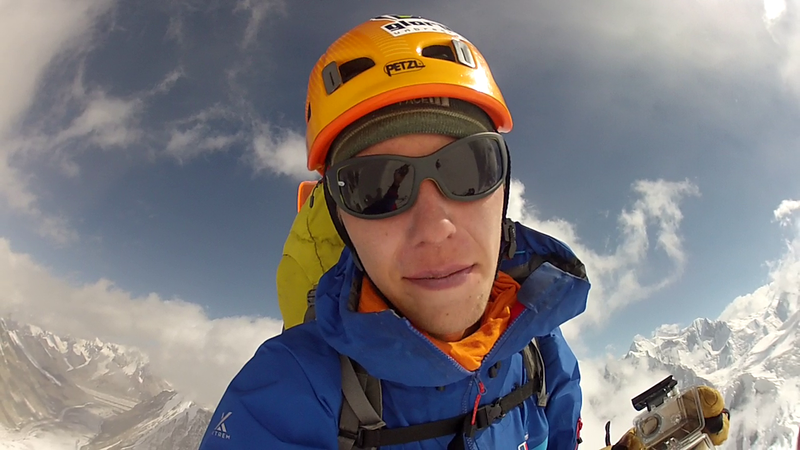 Pobeda is harder than many 8000 meter peaks they say. 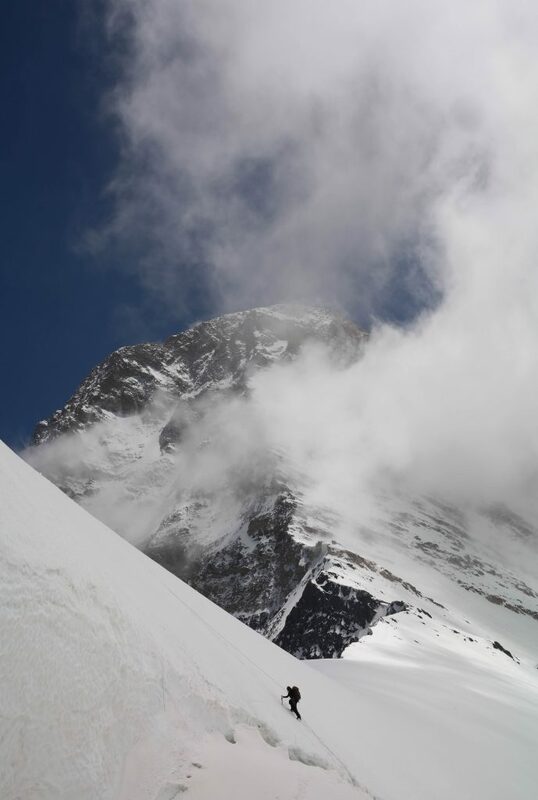 At first, I didn`t believe that, but upcoming weeks showed brutal and extremely dangerous mountain. It takes your last breath away very easily! I found old friends at BC. Kazakh pilots doing some work! We did short climbs around BC. Massive Inylchek glacier and BC. Nights get colder towards mid August. Finally we received optimistic weather forecast and begun a 4 hour walk to C1. I teamed up with Paul (UK) due to safety reasons. 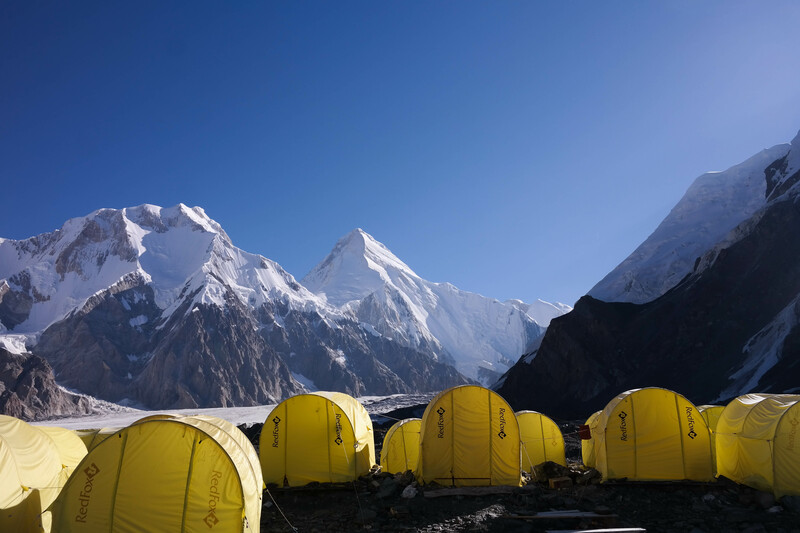 Camp 1 (4500m) under the mighty N face of Pik Pobeda. Wouldn`t camp here ever again. Serac avalanche danger is obvious. 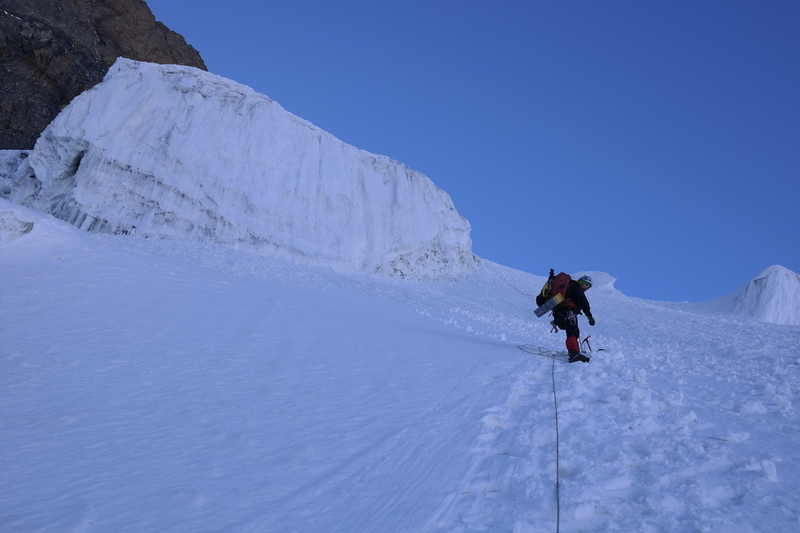 Route up to Dikiy Pass (5200m) required serac climbing. Normal route follows the West rib on the right. 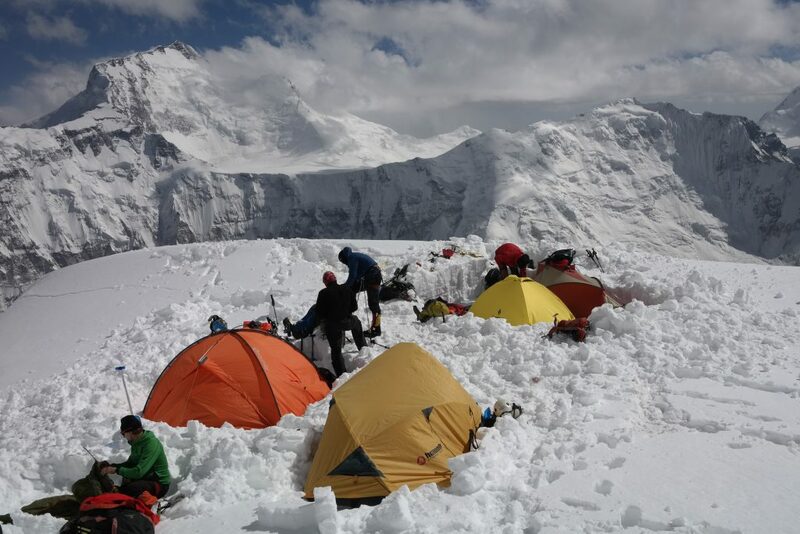 Long day from the C1 to C3 (5800m). Some teams camp at Dikiy Pass. It`s safer, but elevation gain is too small fo the second day. BC´s far away! We slept in a snow cave at 5800 meters. 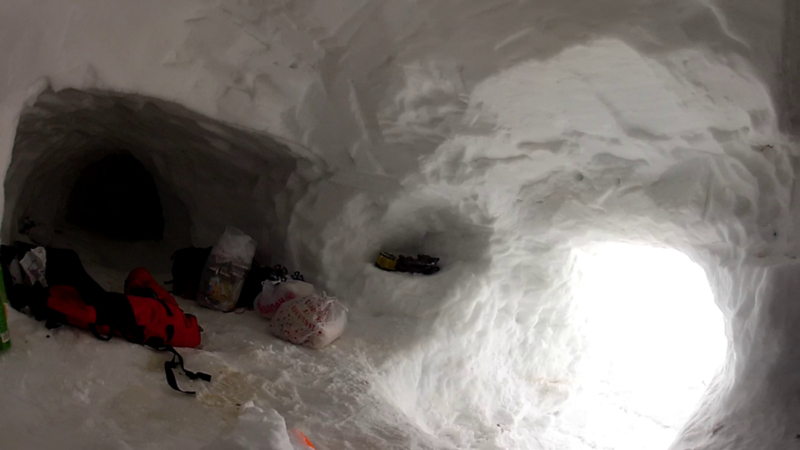 Warm and the best option to survive on Pik Pobeda. 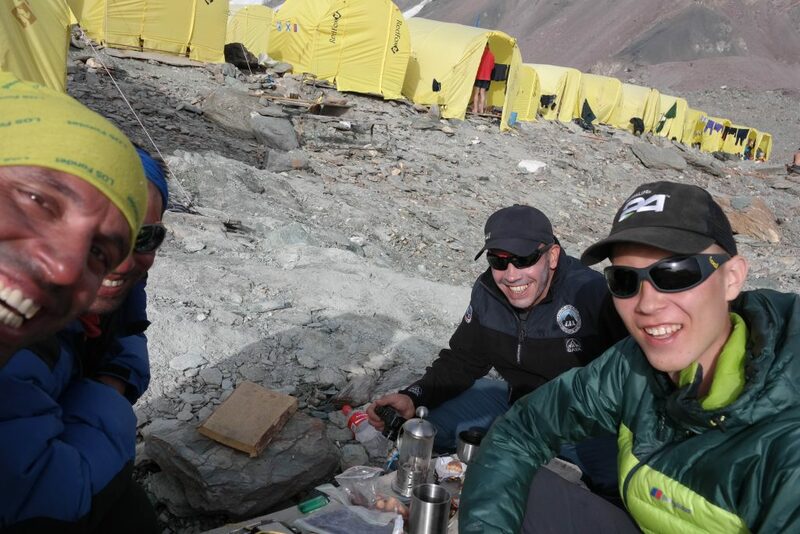 Day three took us up to C4 (6400m). 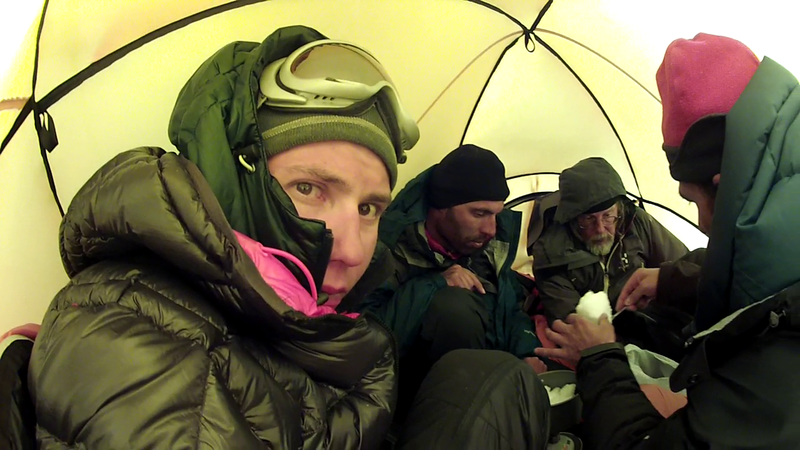 Plan was to reach C5 on the upper ridge, but snowstorm forced us to camp lower. That night became a battle against the wind. 100km/h winds hammered our tents. Eventually joined Iranian team. Barely managed to avoid real epic. The whole thing was about to become too dangerous. I returned back to BC next day. 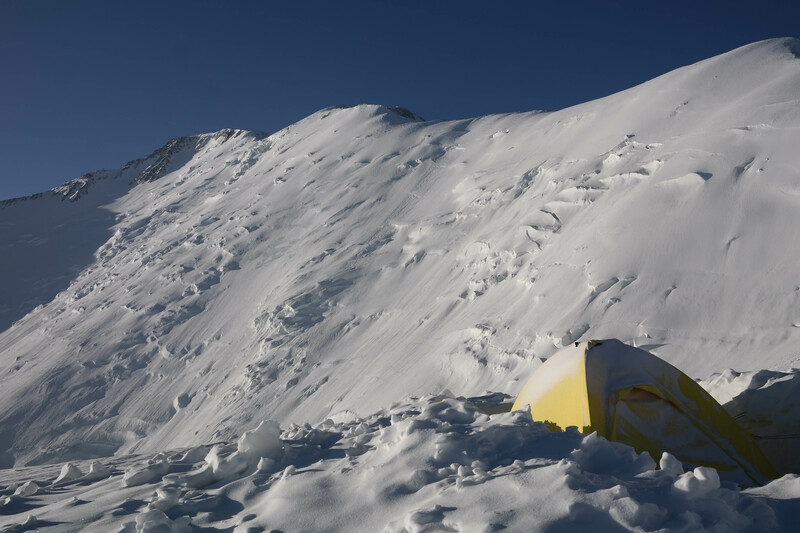 Big national teams of Russia and Ukraine summited Pobeda in hurricane winds, one died and other were half dead. 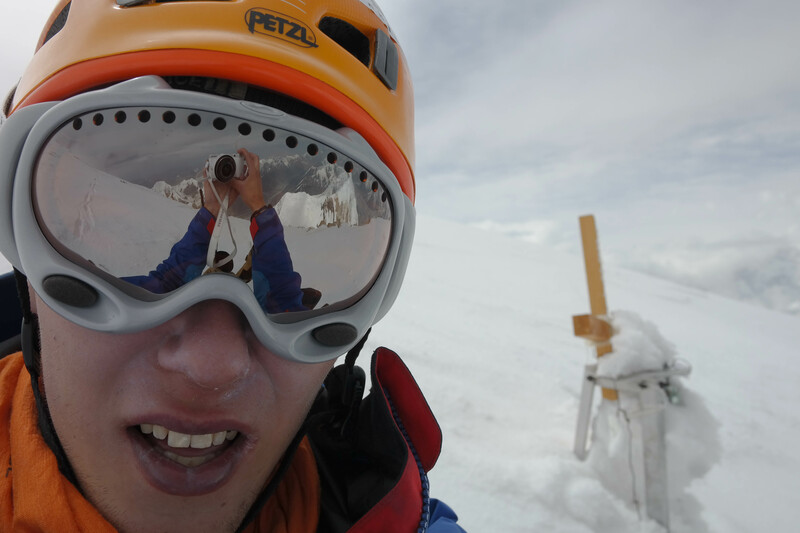 There´s many ways to climb these peaks. I think I have found my own! 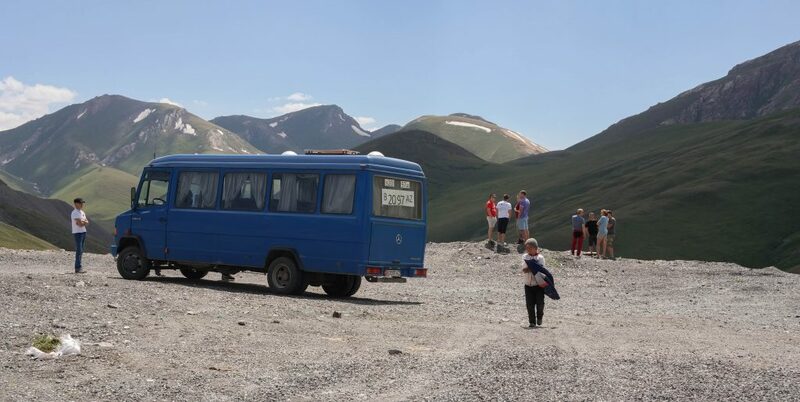 Two summers in the Central-Asia teached a lot. 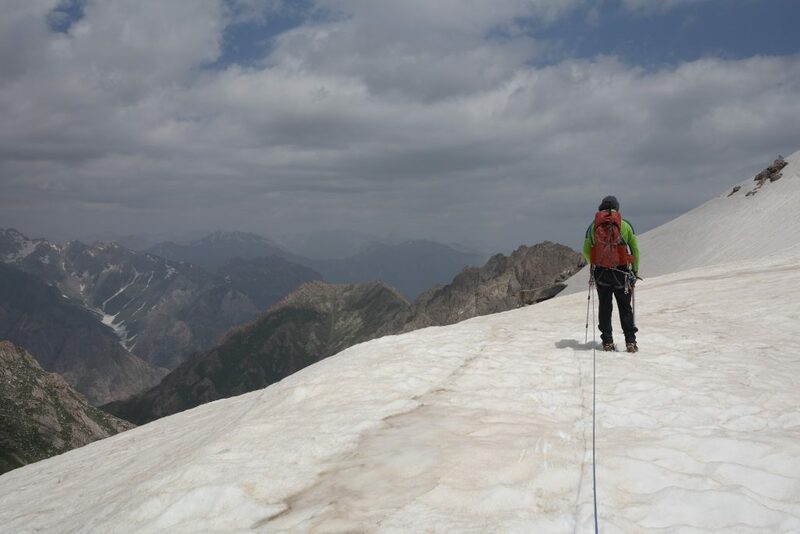 I definately will return to climb Kommunizma and Pobeda, but for now, more technically challenging objectives has my interest. Dude, solid pages and good stories told. Bujakah!